We have added a “new look” to our product line!! 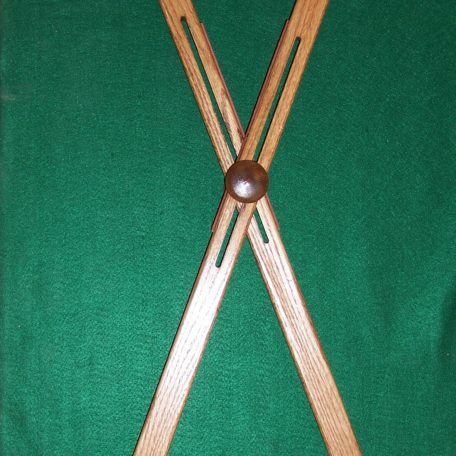 These cross sticks are still the traditional 48″, which meet the proper configuration requirements for NRA, SASS, and BPCR sanctioned competition. 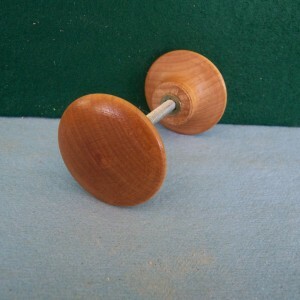 However, they have a square top and wooden knobs, for a more “period correct” look!! As with all our individually hand crafted Buffalo Cross Sticks, they have the “Easy Slide Adjustment” that makes our product so unique. No cumbersome leather cradle/barrel support and predetermined adjustment holes!! The height can be quickly adjusted by loosening and sliding the knob up or down in the “Easy Slide Adjustment Groove”. Cat’s Shooting Sticks are hand crafted from solid oak 1 x 2’s and a 3/8 ” wide leather strip on each stick protects the finish of the rifle barrel and helps hold the rifle barrel in position. The 6″ spike inserted into the bottom leaves 3″ protruding, so they can be easily pushed into the ground for a solid shooting position. We have added a new feature to our product line!! 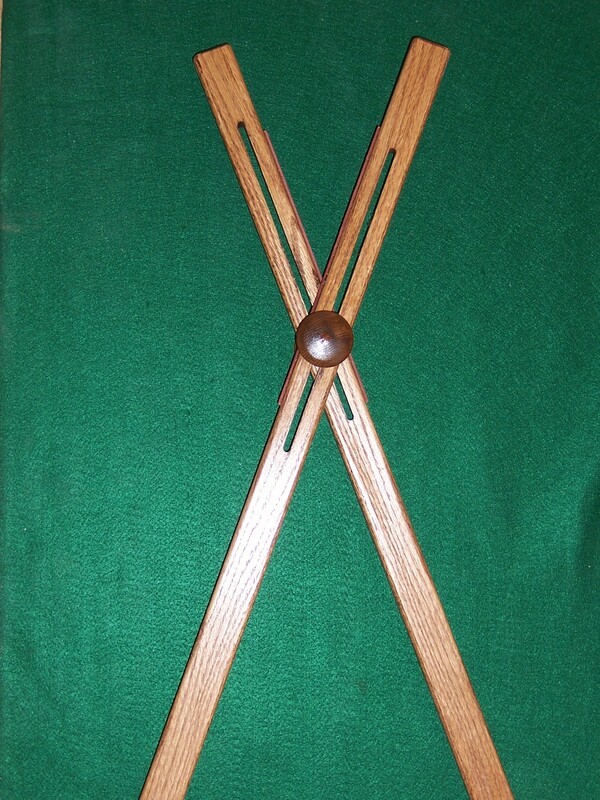 These cross sticks are still the traditional 24″, which meet the proper configuration requirements for NRA, SASS, and BPCR sanctioned competitions. 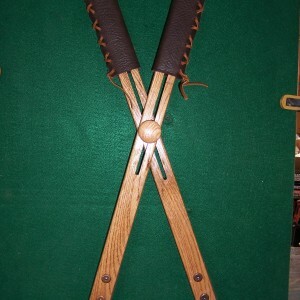 However, they have Steel Blades Bolted with Decorative Bronze Bolts into the sticks in place of the 6″ spikes. As with all our individually hand crafted Buffalo Cross Sticks, they have the “Easy Slide Adjustment” that makes our product so unique. No cumbersome leather cradle/barrel support and predetermined adjustment holes!! The height can be quickly adjusted by loosening and sliding the knob up or down in the “Easy Slide Adjustment Groove”. 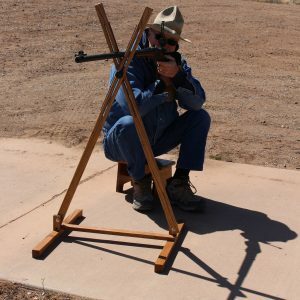 Cat’s Shooting Sticks are hand crafted from solid oak 1 x 2′s and a leather slide ( Included) on each stick protects the finish of the rifle barrel and helps hold the rifle barrel in position. The 6″ blade inserted into the bottom leaves approximately 3″ protruding, so they can be easily pushed into the ground for a solid shooting position. 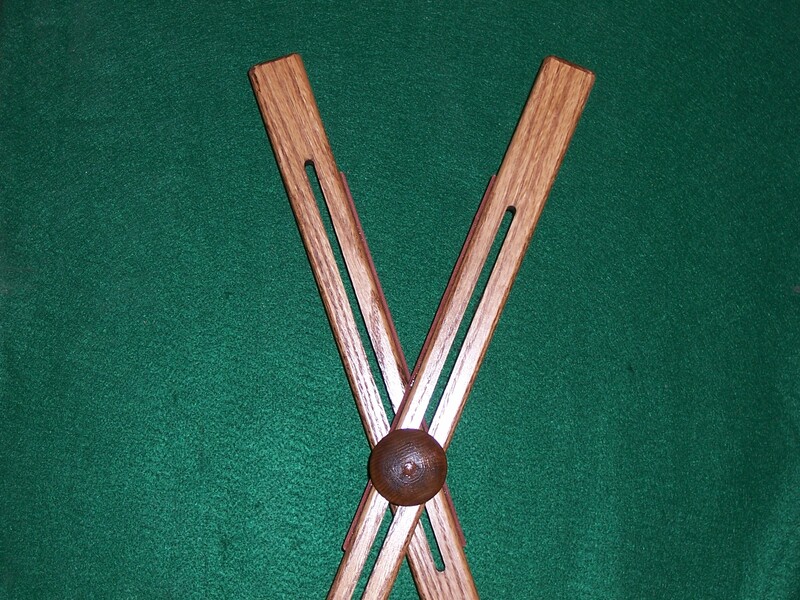 Cross Sticks pulls allow the shooter to re-position the shooting sticks without changing his or her position. Made of deer antlers and rawhide. 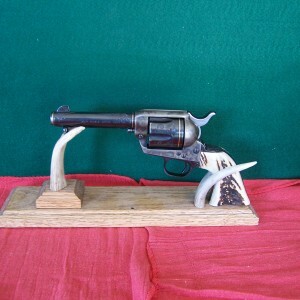 Single antler revolver display stand. The base is made of solid oak. The width of the base is approximately 4 inches and length is approximately 13 inches. Each piece is unique and actual’s will vary. 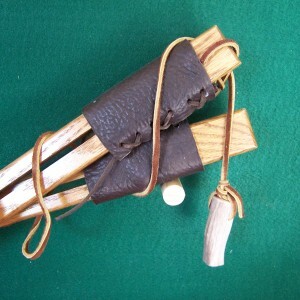 New from Cats Shooting Sticks: THE BASIC QUIGLEY MODEL ! 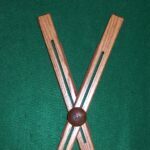 These cross sticks are as functional as our original, Buffalo Cross Sticks, however, these were developed for the QUIGLEY MATCH, WHERE PRONE SHOOTING IS NOT ALLOWED !! The construction of the BASIC QUIGLEY MODEL, allows to overcome most ground conditions. Set these down, adjust for target, and you’re good to go. As far as stability, don’t judge before you try them. You will be astonished at how stable they are . Made with the finest oak cuts, our unique EZ SLIDE HEIGHT ADJUSTMENT FEATURE and secured with poly hand knobs. 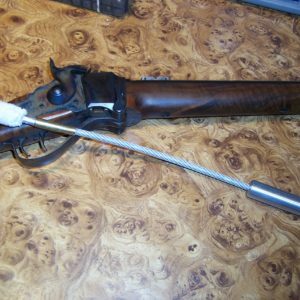 This BASIC QUIGLEY MODEL includes the 3/8″ wide leather strips to protect your rifle barrel. The minimum height adjustment is 25″ from the ground, to a maximum of 44″, which means a full 19″ of adjustments. 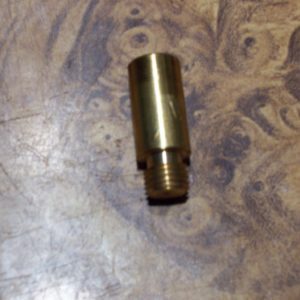 As always, custom lengths can be accommodated, incurring a slight additional charge. Initially, some minor assembly is required, with only a Philips screwdriver. 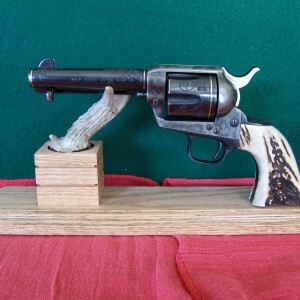 Oak and deer antler revolver display stand (double antler). The base is made of solid oak. Great for displaying your favorite six-shooter , Dimensions of base are 13 x 4. Each one is unique. Actual’s will vary.